Katharine Q. Seelye and Jess Bidgood, “Breaking Silence, Dzhokhar Tsarnaev Apologizes for Boston Marathon Bombing,” New York Times, June 24, 2015, http://www.nytimes.com/2015/06/25/us/boston-marathon-bombing-dzhokhar-tsarnaev.html?_r=0. In May 2015, Tsarnaev was sentenced to death by a unanimous jury vote in Boston, after he was found guilty the previous month on 30 charges relating to the bombing attack.Milton J. Valencia and Patricia Wen, “Tsarnaev guilty on all counts in Marathon bombings,” Boston Globe, April 8, 2015, https://www.bostonglobe.com/metro/2015/04/08/tsarnaev-jury-begins-second-day-deliberations/t7KplwR18hH1RSuX1BQohM/story.html. At the Boston marathon, the Tsarnaev brothers placed two pressure-cooker bombs near the race’s finish line. Each device “killed at least one person, maimed, burned and wounded scores of others, and damaged public and private property,” according to the criminal complaint filed against Tsarnaev.“United States of America v. Dzhokhar Tsarnaev,” United States District Court for the District of Massachusetts, April 21, 2013, http://www.justice.gov/iso/opa/resources/363201342213441988148.pdf. Three days after the bombings, on April 18, the brothers carjacked a vehicle and fled to Watertown, Massachusetts, west of Boston. On April 19, Boston police and SWAT team members found Dzhokhar Tsarnaev hiding in an upturned boat in a backyard at 67 Franklin Street, Watertown. After a gunfight that killed Tamerlan and injured Dzhokhar, Dzhokhar was arrested and brought in for questioning.“United States of America v. Dzhokhar A. Tsarnaev a/k/a/ ‘Jahar Tsarni,’” United States District Court for the District of Massachusetts, June 27, 2013, http://www.justice.gov/sites/default/files/usao-ma/legacy/2013/06/27/Indictment1.pdf. 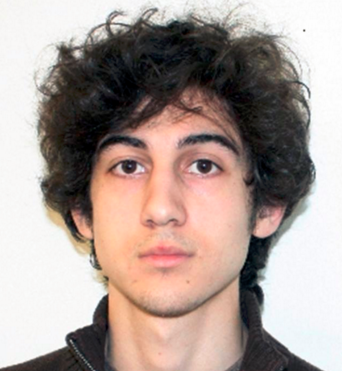 Dzhokhar Tsarnaev was charged with 30 counts and pleaded not guilty to all of them. On April 8, 2015, he was found guilty on all 30 charges including causing death by use of a weapon of mass destruction. The following month, he was sentenced to death by lethal injection. The day after his conviction, he was transferred to a maximum security prison near Florence, Colorado. During his trial, Tsarnaev’s defense lawyers suggested he was heavily influenced by his older brother Tamarlan and therefore less responsible for the bombings.Patricia Wen and Milton J. Valencia, “Tsarnaev defense keeps focusing on brother’s influence,” Boston Globe, April 28, 2015, https://www.bostonglobe.com/metro/2015/04/28/defense-continues-push-for-life-prison-for-tsarnaev-boston-marathon-bomber/GFWPFfPF8PD293g4F6aH7M/story.html. An ethnic Chechen, Tsarnaev was born in the northern Kyrgyz town of Tokmok near the Khazak border. His family fled to Dagestan following the Russian invasion of Chechnya in 1999. His family was also prompted to flee following the purge of Chechens from the Kyrgyz government, which caused his father to lose his job.Janet Reitman, “Jahar’s World,” Rolling Stone, July 17, 2013, http://www.rollingstone.com/culture/news/jahars-world-20130717. Tsarnaev arrived in the United States as a child in 2002, and lived in Massachusetts.Lara Jakes, Matt Apuzzo, and Rodrique Ngowi, “Officials: Suspect described plot before Miranda,” Associated Press, April 25, 2013, http://bigstory.ap.org/article/lawmakers-ask-who-knew-what-about-bomb-suspect. In high school, Tsarnaev was “as American as they come,” became wrestling team captain, and “partied hard and studied when he had to,” according to the Washington Post.Marc Fisher, “The Tsarnaev family: A faded portrait of an immigrant’s American dream,” Washington Post, April 27, 2013, http://www.washingtonpost.com/sf/feature/wp/2013/04/27/the-tsarnaev-family-a-faded-portrait-of-an-immigrants-american-dream/. He became a naturalized U.S. citizen on September 11, 2012.Janet Reitman, “Jahar’s World,” Rolling Stone, July 17, 2013, http://www.rollingstone.com/culture/news/jahars-world-20130717. “United States of America v. Dzhokhar A. Tsarnaev a/k/a/ ‘Jahar Tsarni,’” United States District Court for the District of Massachusetts, June 27, 2013, http://www.justice.gov/sites/default/files/usao-ma/legacy/2013/06/27/Indictment1.pdf. In December 2015, after Tsarnaev’s death sentence was confirmed, his lawyers argued for a re-trial and new sentencing. They argued that his older brother Tamerlan was the mastermind of the bombing, and that it was unfair to hold the trial in Boston because the jury could not be impartial. Tsarnaev is presently held at the Supermax prison in Colorado.Associated Press, “Boston Marathon bomber’s lawyers urge judge to grant new trial,” Guardian (London), December 1, 2015, http://www.theguardian.com/us-news/2015/dec/01/boston-marathon-bomber-dzhokhar-tsarnaev-lawyers-new-trial. Djohar TsarnaevVK, “Djohar Tsarnaev,” accessed January 20, 2016, http://vk.com/id160300242. Dzhokhar Anzarovich “Jahar” TsarnaevAlex Henderson, “10 worst examples of Christian or far-right terrorism,” Salon, August 3, 2013, http://www.salon.com/2013/08/03/the_10_worst_examples_of_christian_or_far_right_terrorism_partner/. Dzhokhar TsarnaevJanet Reitman, “Jahar’s World,” Rolling Stone, July 17, 2013, http://www.rollingstone.com/culture/news/jahars-world-20130717. Jahar Tsarni “United States of America v. Dzhokhar A. Tsarnaev a/k/a/ ‘Jahar Tsarni,’” United States District Court for the District of Massachusetts, June 27, 2013, http://www.justice.gov/sites/default/files/usao-ma/legacy/2013/06/27/Indictment1.pdf. In April 2013, then-19-year-old Tsarnaev carried out the Boston Marathon bombings alongside his brother, Tamerlan Tsarnaev, then age 26. “It’s our responsibility my brothers & sisters to ask Allah to ease the hardships of the oppressed and give us victory over kufr #islam #dua.” (Tweet)Patricia Wen, “Tsarnaev posted radical messages on second Twitter account, FBI agent testifies,” Boston Globe, March 10, 2015, https://www.bostonglobe.com/metro/2015/03/09/tsarnaev-had-second-secret-twitter-account-witness-testifies/lgiJqqmXlD3ua8HmFLnAZO/story.html. “[L]isten to Anwar al-Awlaki” (Tweet)Patricia Wen, “Tsarnaev posted radical messages on second Twitter account, FBI agent testifies,” Boston Globe, March 10, 2015, https://www.bostonglobe.com/metro/2015/03/09/tsarnaev-had-second-secret-twitter-account-witness-testifies/lgiJqqmXlD3ua8HmFLnAZO/story.html.